Stoke City captain Ryan Shawcross is to undergo back surgery and will miss the first two months of the season. The 27-year-old centre-back missed six weeks last season with back trouble. And he has been limited to just over an hour's action during Stoke's pre-season programme because of the problem. But goalkeeper Jack Butland is confident the Potters have adequate cover, telling BBC Radio Stoke: "To lose him is a big loss, but we've got players capable of filling the void." Marc Wilson, Marc Muniesa and Philipp Wollscheid are defensive options for Potters manager Mark Hughes, as his side prepare for their Premier League opener against Liverpool on Sunday. Butland added: "The likes of Geoff Cameron, Marc, Philipp and Muni are top-class centre-halves and would be brilliant replacements." 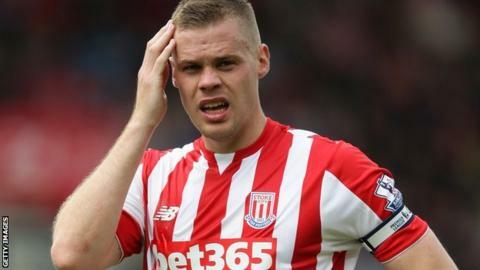 In the five Premier League games Ryan Shawcross missed last season, they won three (Aston Villa, Hull, Everton), drew one (Newcastle) and lost once (Manchester City). They conceded six goals and kept two clean sheets in the process.